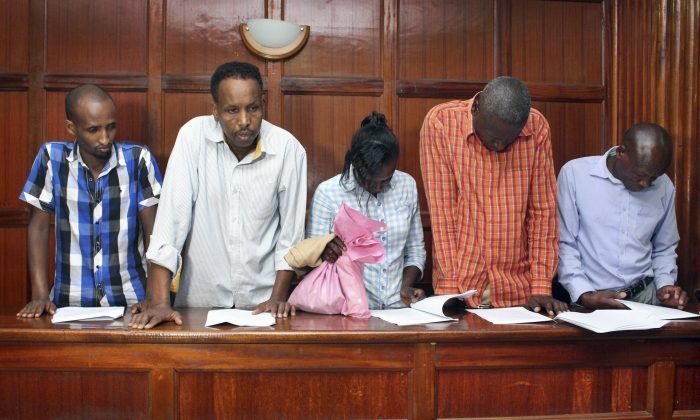 NAIROBI, Kenya—A Canadian national and four other people suspected of helping extremist gunmen stage a deadly attack in the Kenyan capital this week appeared in court on Jan. 18 as prosecutors investigated them for suspected terror offences. A judge ordered the five suspects held for 30 days while authorities look into the assault on the dusitD2 hotel complex. The al-Shabab terrorist group, which is linked to al-Qaida and based in neighbouring Somalia, claimed responsibility. Kenyan authorities say 21 people, including one police officer, were killed by the attackers, one of whom blew himself up beside a restaurant. Another four gunmen died. Prosecutors suspect the alleged accomplices, including two taxi drivers and an agent for a mobile phone-based money service, of “aiding and betting” the attackers who stormed the Nairobi complex on the afternoon of Jan. 15 on and were killed by the morning of Jan. 16, according to a court document. Prosecutors said they were pursuing more suspects in and outside Kenya. Gichunge’s father, who is not believed to have been involved in the attack, was summoned for questioning about when he last saw his son and other details, a senior police official said. He spoke on condition of anonymity because he was not authorized to speak to the media. The attack was denounced on Jan. 18 in Eastleigh, a Nairobi neighbourhood that is home to many ethnic Somalis and has been targeted in massive police operations against suspected extremist cells. Shop owners temporarily closed businesses to protest against extremism, and crowds gathered. Al-Shabab also carried out the 2013 attack at Nairobi’s nearby Westgate Mall that killed 67 people, and an assault on Kenya’s Garissa University in 2015 that claimed 147 lives, mostly students. While U.S. airstrikes and a multinational African Union force in Somalia have reduced the Islamic extremists’ ability to operate, al-Shabab is still capable of carrying out spectacular acts of violence in retaliation for the Kenyan military’s presence in Somalia. The attackers who stormed the hotel complex opened fire and set off grenades, sending panicked people running for cover as security forces converged. Security camera footage released later showed a suicide bomber blowing himself up in a grassy area. A hotel employee, seen in the footage walking past the bomber just before the explosion, described in an interview with Kenya’s K24 television how he heard the man talking on a mobile phone. “Where are you guys?” the agitated bomber said at least a couple of times, according to Abdullahi Ogelo, the employee. Ogelo, who later concluded the bomber had been talking to his accomplices, said the man was also moving his hand over his chest.